Close-up of California's bear flag. 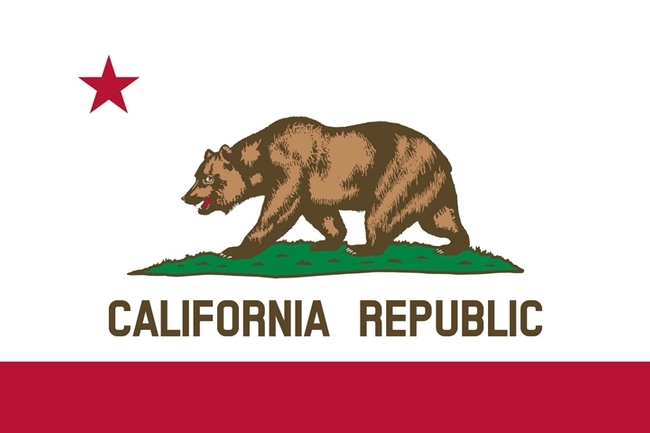 You've heard of the California Bear Flag, the one with the grizzly bear" right? It's lettered with "California Republic." 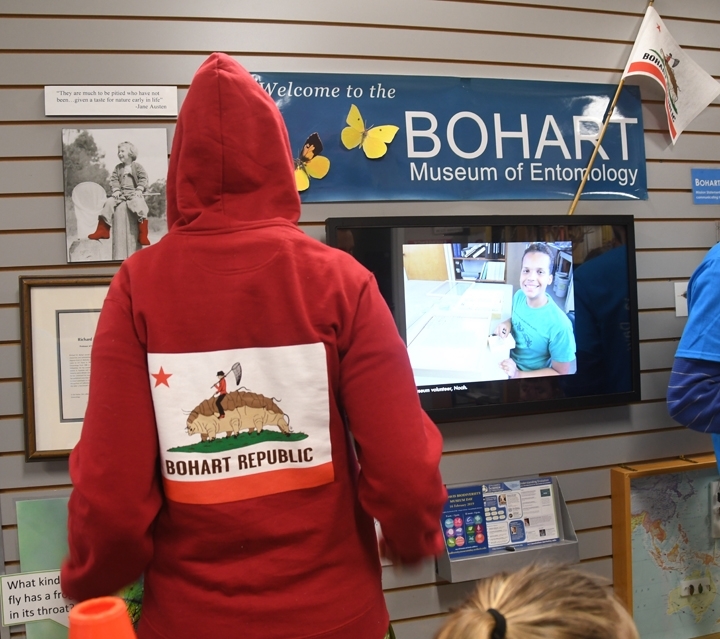 But have you heard of the "other" bear flag that's on a hooded sweatshirt at the Bohart Museum of Entomology at the University of California, Davis? It's lettered with "Bohart Republic." The Bohart flag features a water bear or tardigrade, the creative work of UC Davis entomologist/artist Charlotte Herbert Alberts. 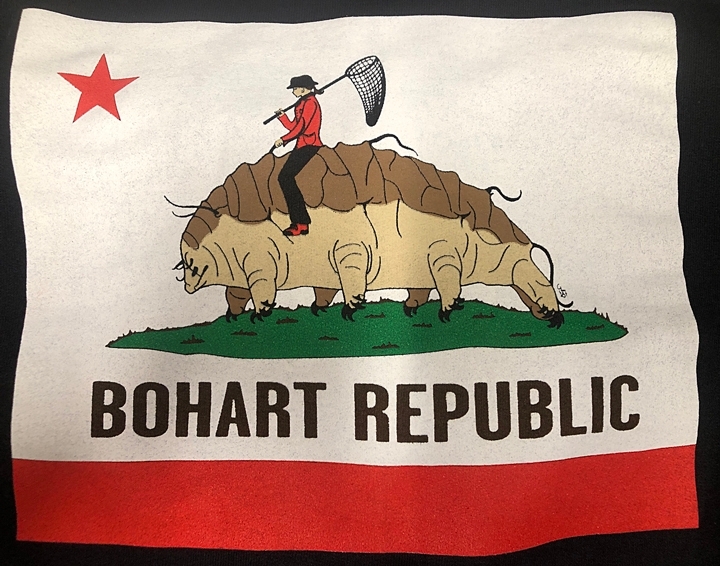 Besides living on the Bohart sweatshirts, the tardigrade is a microscopic, water-dwelling animal that lives just about everywhere: "from the mountaintops to the deep sea and mud volcanoes; from tropical rain forests to the Antarctic," according to Wikipedia. 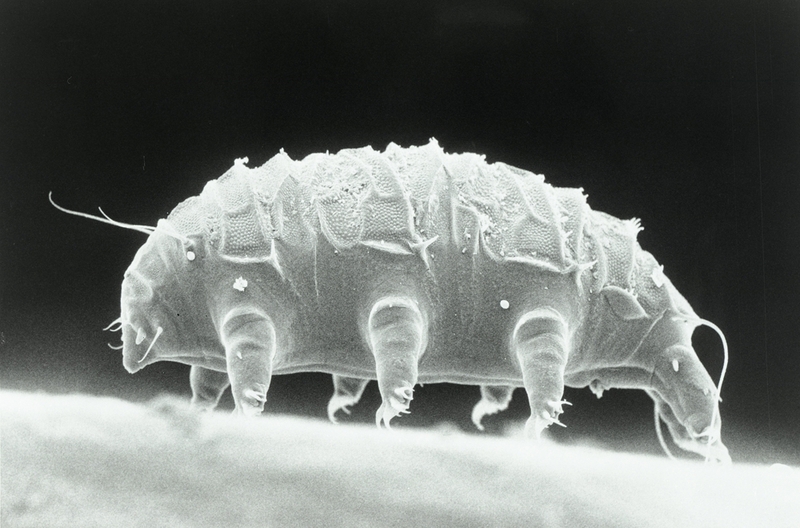 German zoologist Johann August Ephraim Goeze, who first described them in 1773, called them "little water bears." The name stuck. "Water bears." "Tardigrades are among the most resilient known animals, with individual species able to survive extreme conditions that would be rapidly fatal to nearly all other known life forms, such as exposure to extreme temperatures, extreme pressures (both high and low), air deprivation, radiation, dehydration, and starvation," Wikipedia says. "Tardigrades have even survived exposure to outer space. About 1,150 known species form the phylum Tardigrada, a part of the superphylum Ecdysozoa. The group includes fossils dating from 530 million years ago, in the Cambrian period." 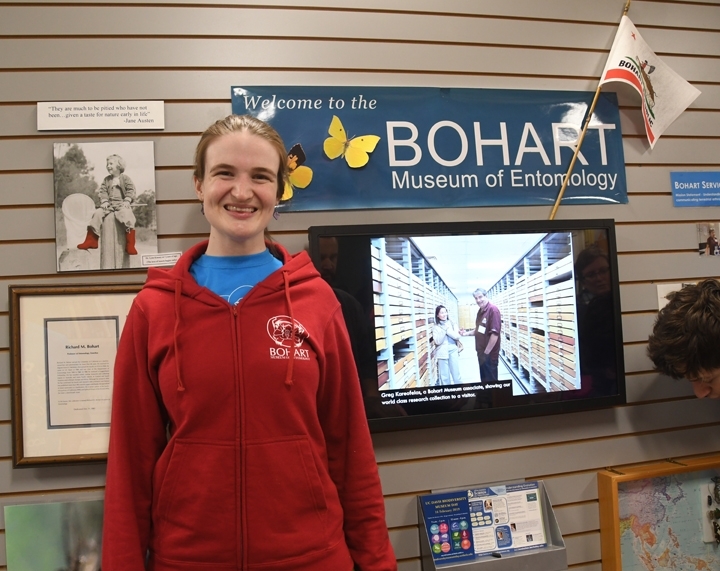 Alberts is a doctoral candidate in entomology who studies with Lynn Kimsey, director of the Bohart Museum and a UC Davis professor of entomology. How did she get the idea? "I came up with the tardigrade flag idea in my sleep!" she said. "The next morning I told Lynn and she loved it." Then Alberts and Kimsey conferred with Tabatha Yang, education and outreach coordinator, and Bohart associate Fran Keller, assistant professor at Folsom Lake College and a UC Davis alumnus (she holds a doctorate in entomology) "to figure out the details"--like the entomologist holding a net and riding the tardigrade, and the name, "Bohart Republic." "The entomologist is no one in particular," Alberts said, "but she's a female because I think it is important to encourage more women into the field of entomology." "So far, the reactions have all been super positive!" she commented. "My family and friends are all asking for one!" The water bear hoodies were also a big hit Saturday, Feb. 16 at the Bohart Museum during the eighth annual campuswide Biodiversity Museum Day. The gift shop buzzed with sales. Specifics? The hoodies come in three colors--red, gray and black and in sizes ranging from extra small to extra extra large. Located in Room 1124 of the Academic Surge Building on Crocker Lane, the Bohart Museum, home of a global collection of some eight million insect specimens, is open to the public from 9 a.m. to noon and from 1 p.m. to 5 p.m., Monday through Thursday. 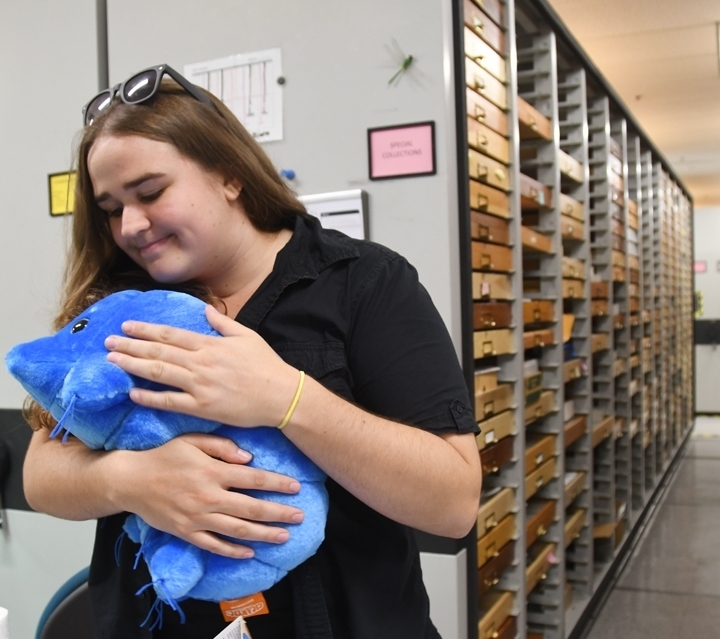 A bright blue stuffed animal tardigrade in the gift shop also sells well. "I do not have a stuffed tardigrade but often gaze fondly at the ones for sale at the Bohart," Alberts commented. "I would love to adopt one... but am worried that our sweet puppy will think it is for him." As for the real tardigrades, they have always fascinated her, especially "their ability to survive in any environment--even space!" Tardigrade enthusiasts love them more than they can "bear."